George H.W. Bush was born on June 12, 1924 and died on November 30, 2018. He was not a grandstander, he didn’t boast, he was not exciting. Our 41’s President was wealthy, a person born to advantage and privilege, a bit clueless about the daily lives of people who struggled. He was a person who served our country with distinction in the military, as a diplomat, government agency leader, politician and as a person who tried to understand the points others made. He tried to find non-ideological solutions that accommodated others. He was a person who compromised without shame, built coalitions based in common interests and shared values, a man who usually appealed to the better angels of our nature and who tried to do the right thing. He was a family man, and he and his wife Barbara seemed to have occupied fairly traditional roles within the household. It was a life straight out of 50’s American “Leave it to Beaver” TV… except that Barbara Bush was known as “The Enforcer” and arguably was the dominant force within the family, daughter Robin Bush died just before her forth birthday from leukemia, and his eldest son for a time struggled mightily with alcohol use. You don’t find such realities in sitcoms. George and Barbara clearly loved one another and together built a strong family. We should all do as well. We made fun of his penchant for speaking in disconnected phrases, writings that were largely comprised of thousands of brief thank-you notes, and for a lack of soaring rhetoric in his speeches. “A thousand points of light…” was both an image of hope and a statement that government’s prime role for the less fortunate was to be a sidelines cheerleader for volunteerism. Depending on your political philosophy and lived experience, you either supported or derided the image. I would argue that he was a good man who did his best to strengthen our civil society, and that he was a better President than some who have attracted more attention and recognition for the role. The best remembrance of George Bush I’ve seen in print is the TIME article, and it is worth a read. He was a person true to himself, generous in victory, stoic and good-natured in defeat, a man who was proud to be an American and tried to do right by his lights for all people in the country. 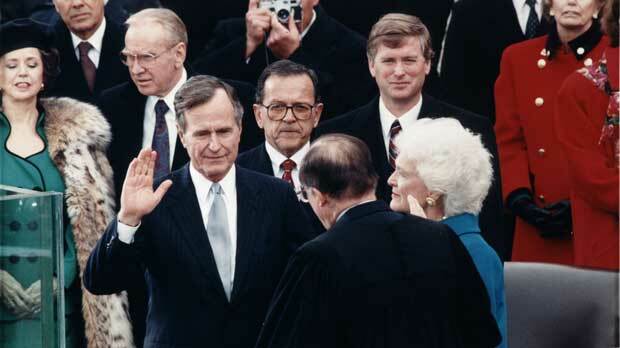 Regardless of political philosophy or party, we can be proud to have elected George Bush as our 41st President. Thank you Mr. Bush, for your service to America. You made this country a better place. Mark Oppenheim is a search consultant and admitted nonprofit wonk. He manages organizations that advance the work of nonprofits.